I had another great year of wild experiences. One of my favorite trips was to see polar bears in the Arctic National Wildlife Refuge within the arctic circle. However, my most memorable experience of 2015 didn’t involve taking photographs. On June 1st, a driver of a F250 pickup going 60mph fell asleep and hit me in a head-on collision. I managed to escape with a broken neck and ankle but thankfully, did not require surgery. After many weeks of physical therapy, many bottles of Ibuprofen and the support of my family and friends, I can now resume exploring the wild places even though I am not 100 percent back to normal. Of many pictures I took here are some of my favorites. 5. 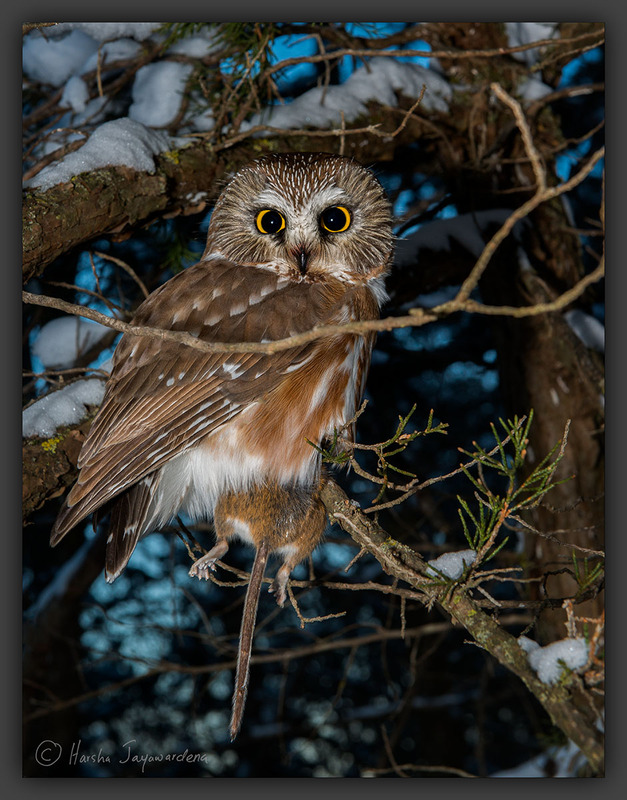 Saw Whet Owl with a mouse. I was excited to received the new Nikon 600/F4 FL VR lens from Allen camera recently. 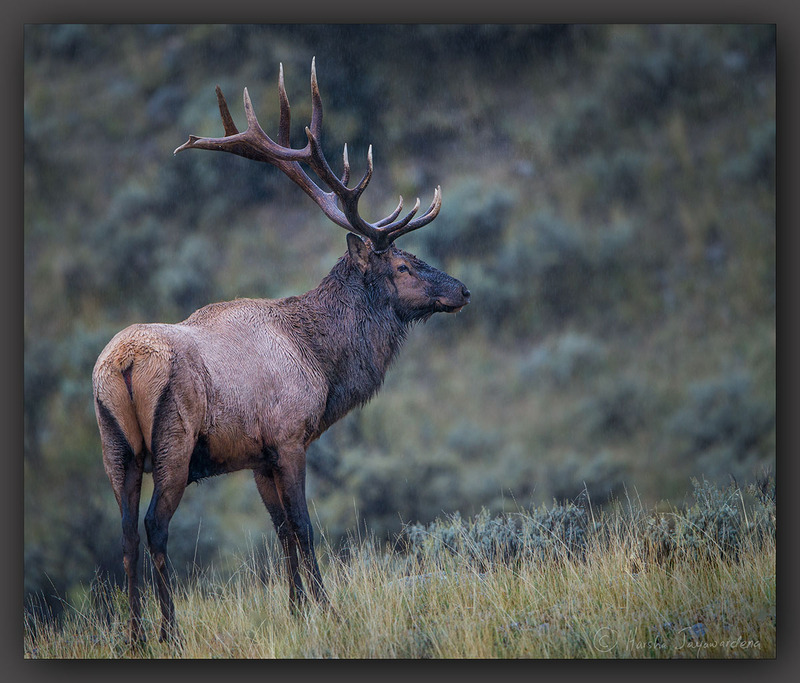 Many people ask “why get the bigger 600mm and not the lighter 500 or 400mm lens”? The choice depends on so many factors including the subject that one shoots. 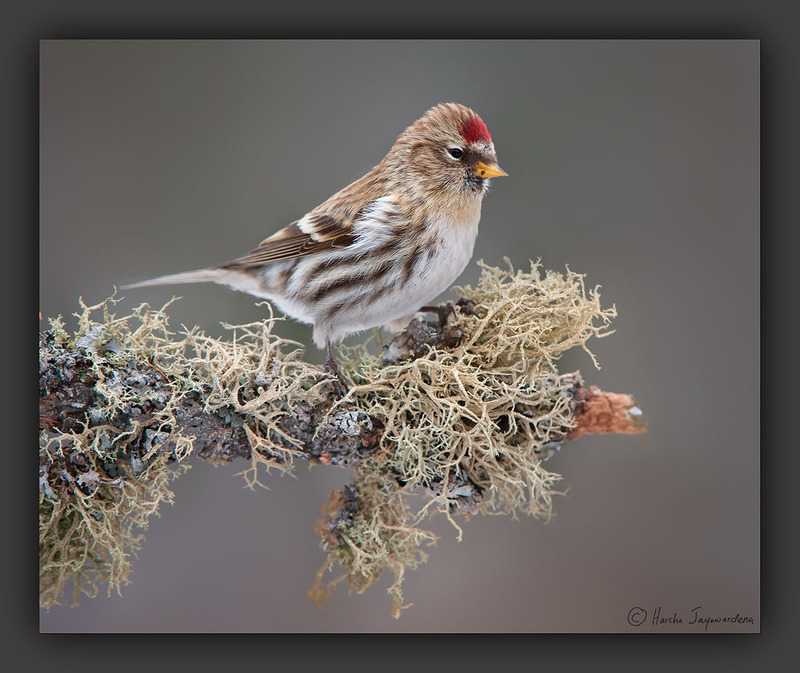 The famous Canadian nature photographer Brad Hill wrote an excellent article about this on his blog site. 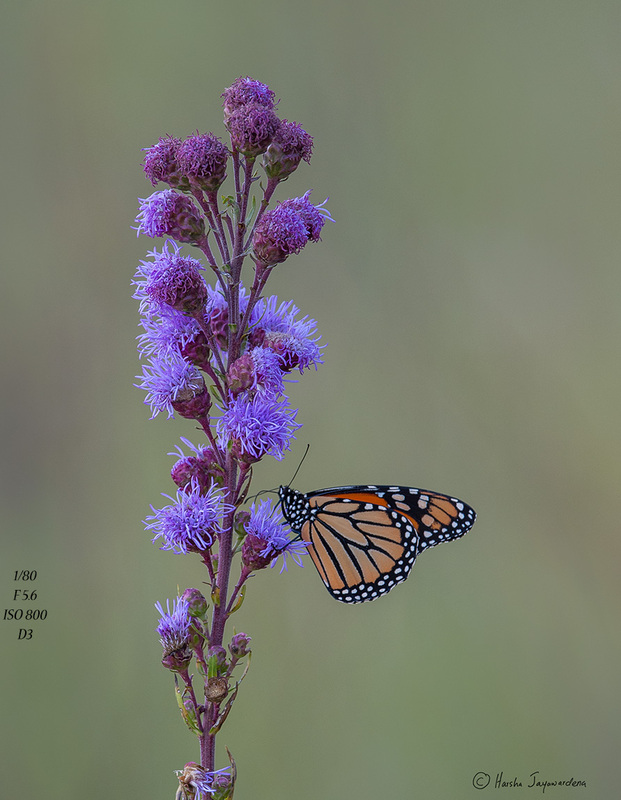 Scroll down to the July 9th 2015 blog post where he talks about pros and cons of all three super telephoto lenses. 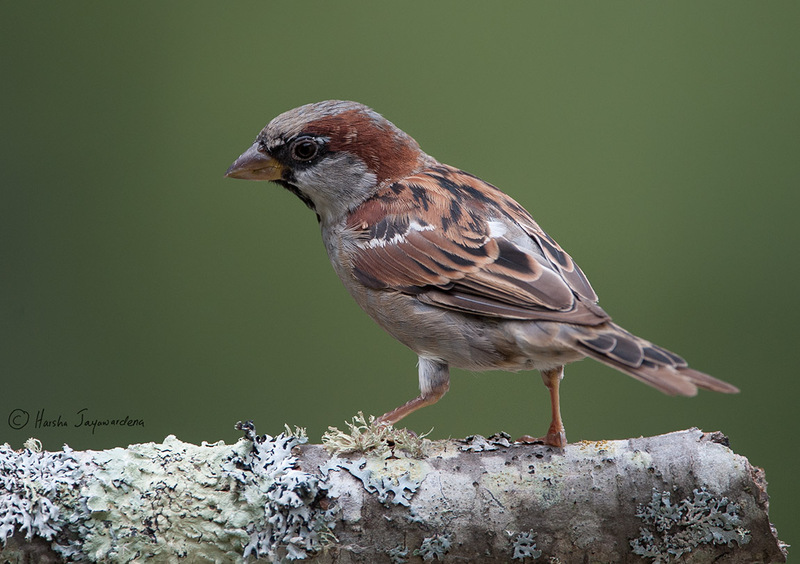 I like to photograph song birds that are very small and the Nikon 600mm works well for me. Since I have only full frame sensor cameras, I need all the reach I can get. 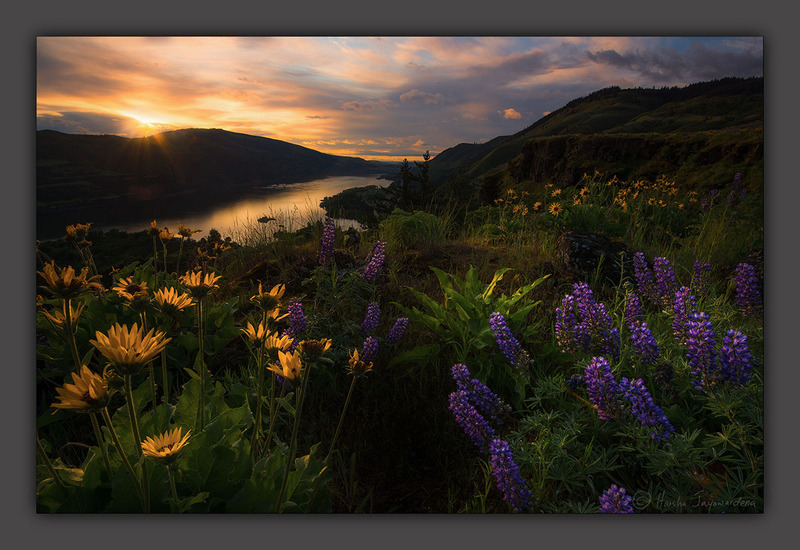 Once you get spoiled by the quality of full frame Nikon sensor files, it is hard to go back to a crop sensor camera. My old 600VR is excellent but heavy at 11.5 LBS making it very difficult to handhold. When Nikon announced the new lens that was only 8.4 lbs ( that is 3 lbs. lighter than the older one), I was very excited. 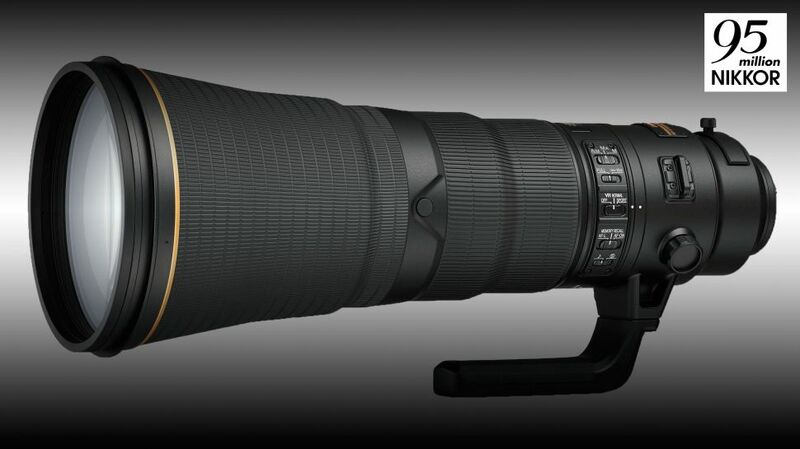 Nikon claims that this is the world’s lightest 600mm super telephoto lens. You can read all about the specs of the lens on many websites and I am not going to go over that here. The new lens came in a custom made case which is light and modern compared to the wooden box of the older lens. The new Nikon lens is lighter than the newest Canon EF 600mm f/4L IS II USM . As soon as I lift the lens from the case I felt a difference. The lens was lighter and I knew I could handhold the lens at least for few shots. This is a big deal. I used one of the third-party straps ( Peak Design) to secure the lens and carried around my shoulder without much of a discomfort. 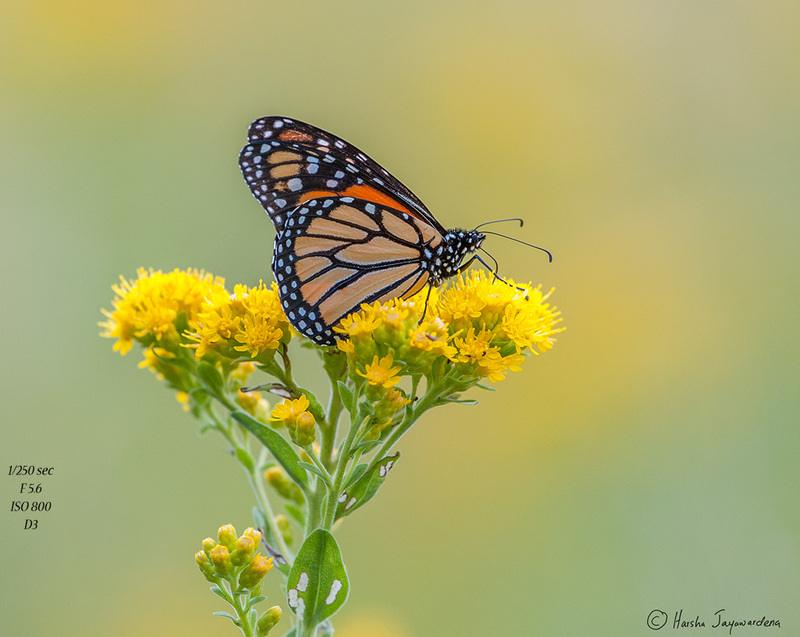 The next day I walked closed to 2 miles at my local nature center carrying the lens. I took nearly 300 shots handholding the lens at various shutter speeds. Keeper rate was very high. I was surprised how well I could handhold the lens for extended periods. Kneeling down and resting the elbow on my knee while holding the lens makes low-level shots easier to make. 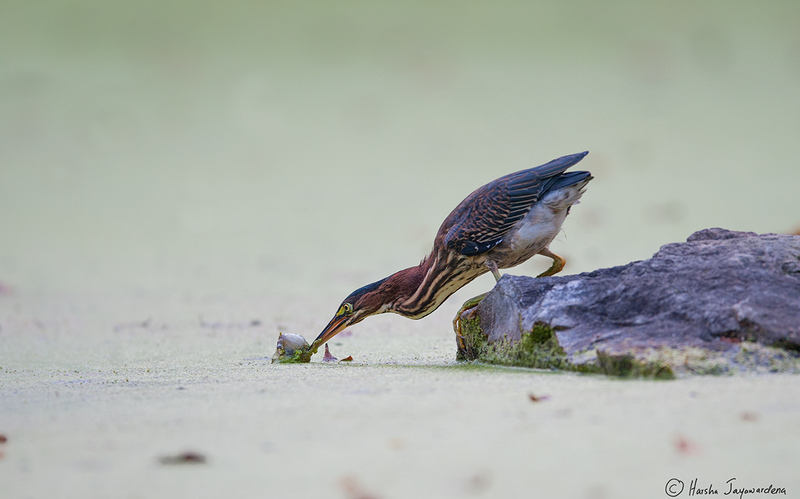 ( Rabbit and the Green Heron images). When upright, I press my elbow against the body to steady the lens. 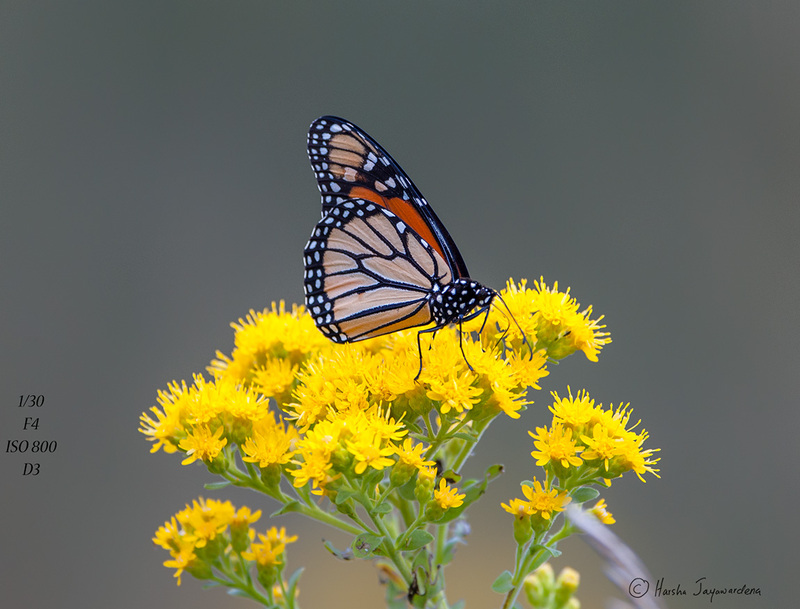 ( Butterfly shots). 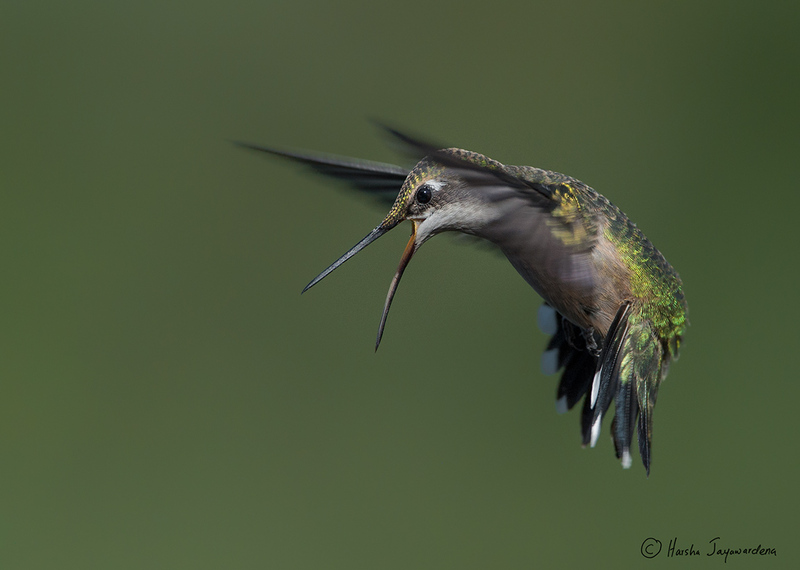 With practice and good technique, sharp images are easier to come by. 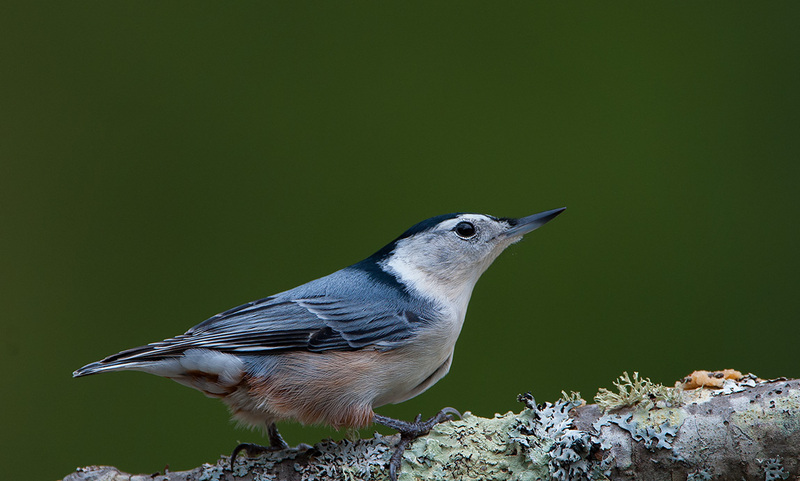 Holding the lens pointing up to get an image of a warbler, way up on a tree top is much more difficult. I still could get a sharper image, but after few seconds I was shaking. I also like the one piece lens hood instead of the two piece one in the older version. However the smaller part of the older hood can be placed inside the larger one for travelling thus saving space. The monopod collar is placed towards the back of the lens compared to the older lens. When a camera is attached, holding the lens from the monopod collar feels well-balanced. The monopod collar comes with a rubberized top for better grip. I attached a Wimberley P-50 plate to the monopod collar so I can mount the lens on a tripod. This plate feels large and P-40 plate may fit better. I don’t think I am going to replace the original foot with a third-party one as I did with the older lens. This lens going to be more versatile with a monopod. The biggest surprised for me was how well the new VR mode works. It is supposed to compensate for 4 stops of light and it does. 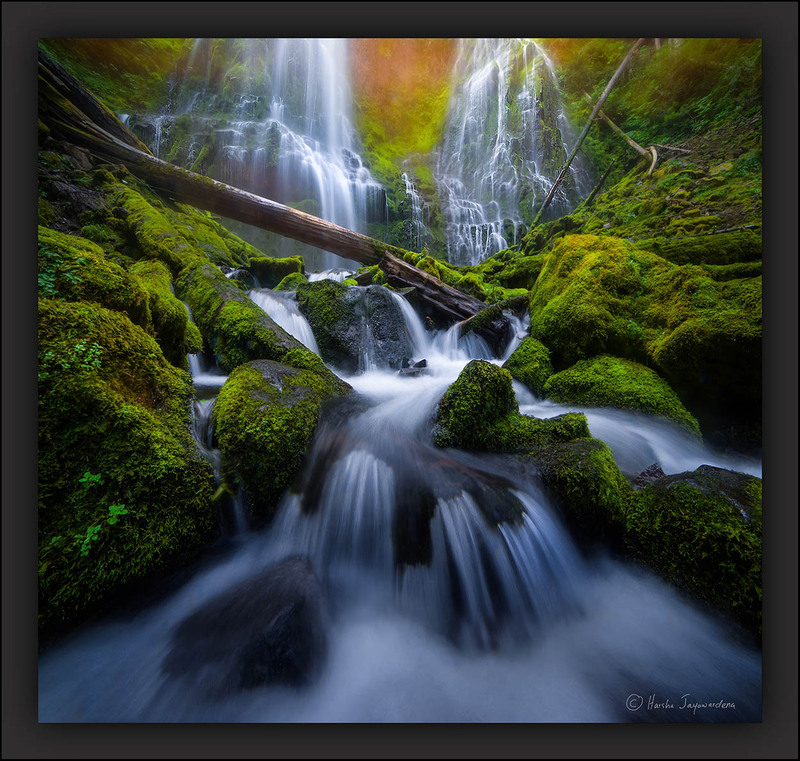 It is possible to handhold the lens and take a sharp shot of a stationary subject at 1/30th of second. In my book that is just amazing. 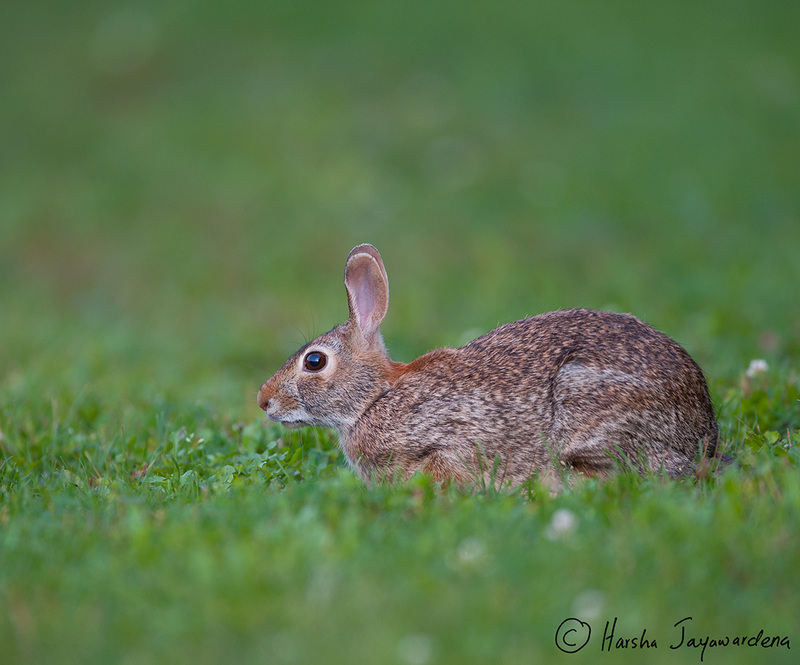 I came across this rabbit while photographing the butterflies. I kneeled down and supported the elbow and lens on my knee and got this low-level shot. With my older lens I had to adjust the tripod to lower level to get this shot and the rabbit would have gone by then. This Green Heron was photographed handholding the lens. How does it pair with the 1.4TC II teleconverter?. ( I don’t have the latest Version III ). Quite well. The autofocus is slightly slower compared to the bare lens but the IQ is maintained. 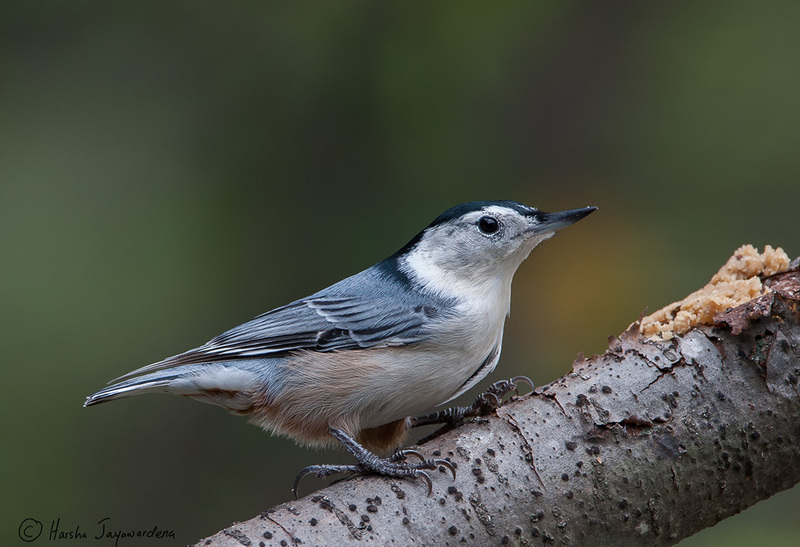 White Breasted Nuthatch at my feeder. Click on the image for bigger version. Another improvement is the electromagnetic aperture mechanism of the lens. With the older lens if you shoot at 9FPS with my D3, some of the frames have different exposures. This is much improved with the new one and I could notice the uniformity of the exposure during a rapid fire. The new version is little shorter compared to the older version. (432mm Vs 444.5mm). 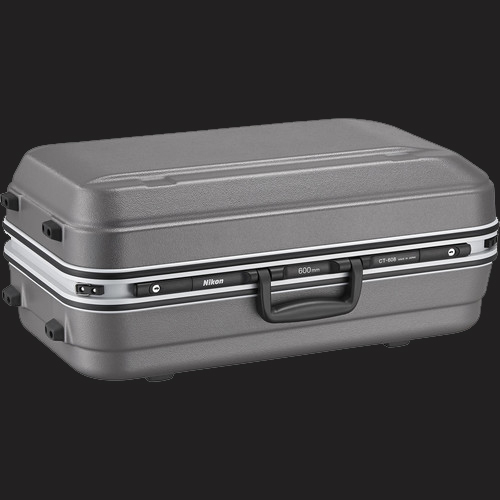 This negligible difference makes a significant impact in portability. When I travel, I couldn’t pack the older lens with a camera attached to my Gura gear Kiboku 32L backpack. With the length difference, now I can pack 600FL VR lens with a D800 attached to one compartment of the bag. VR implantation has changed as well. It is a switch instead of a ring/slider that can accidentally get turned off in the older lens. There are two VR modes. Normal mode is for everything except when the subject moves erratic or you’re on a moving platform like a boat when sport mode is used.. Sport mode is also recommended for panning. I have not had the opportunity to use the sport mode yet but normal mode is very effective. The drop in filter size has changed to 40.5mm. The Circular polarizer I had for older lens cannot be used on this one. The minimum focusing distance of the new lens is 14.4 feet compared to 15.7′ of the older lens. The difference is only 15″ but that is noticeable and useful. 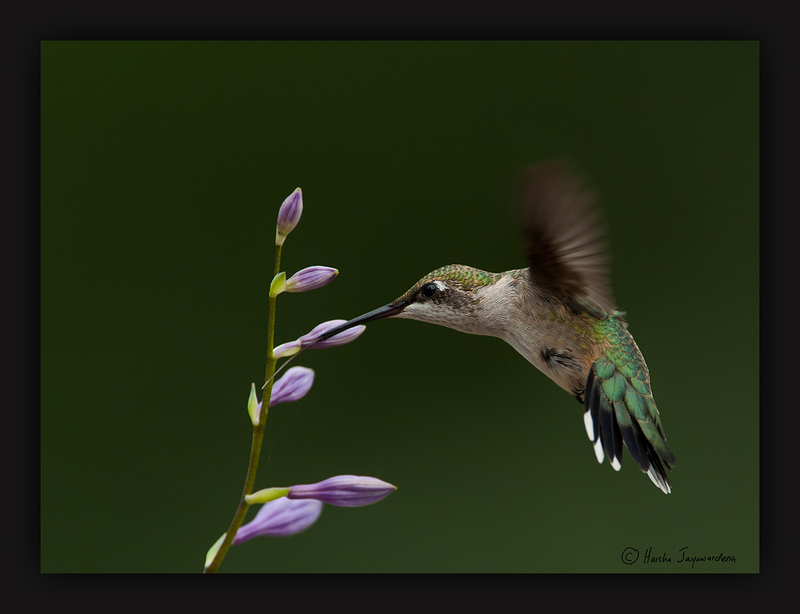 This Hummingbird was photographed very close to the minimum focusing distance. I used the 1.4TC II for this shot. 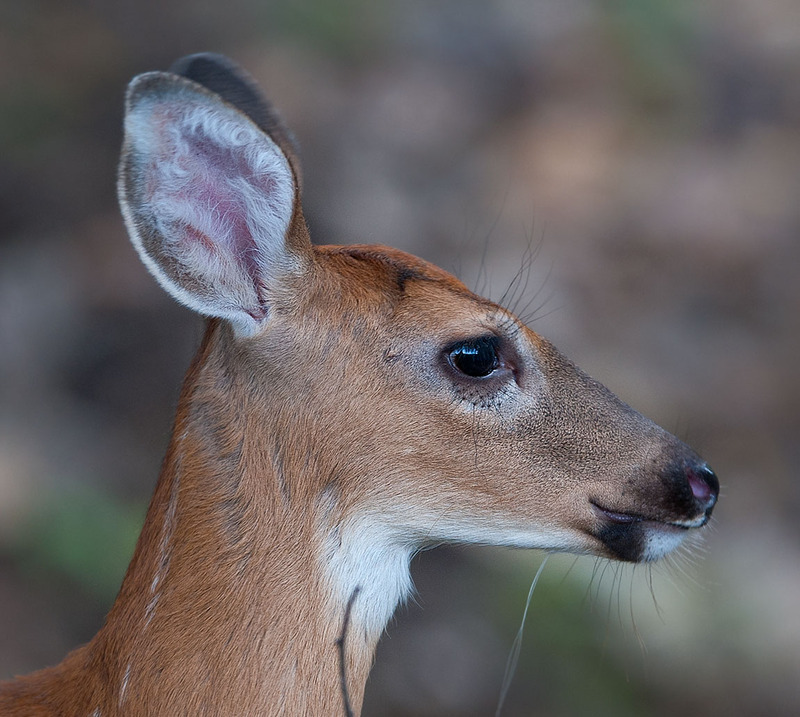 I came across this deer while I was walking to the car at the nature center. Taken handheld. So what about the image quality compared to the old lens? I have used the 600VR lens for about three years extensively and am very familiar with it. The IQ of 600VR is stunning and it is going to be very difficult to top that. I feel that the IQ of the new lens is at least as good or slightly better. The AF acquisition may be a touch faster too. The 1.4TC II works very well with it. The AF with the TC may be slightly better too. The lens vignetting in the corners are improved. I feel the corner sharpness is better. Is it worth upgrading? That is a very difficult question. If you use the lens mainly from a vehicle or on tripod and are not planning to walk carrying it, I would keep the older lens. However weight reduction, ability to hand hold for a short period and the very effective VR makes this a lot more versatile lens than the older VR version. If you’re looking for a 600 super tele, now may be the time to get the older lens at a great price from a person upgrading to the new one. 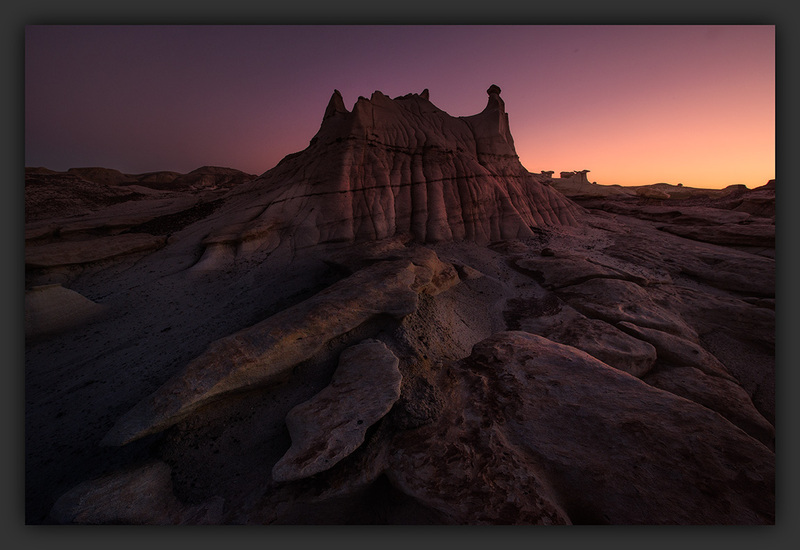 The first time I saw an image of Bitsi Badlands in New Mexico it immediately was added to my list of must see places. Finally I was able to make it happen. 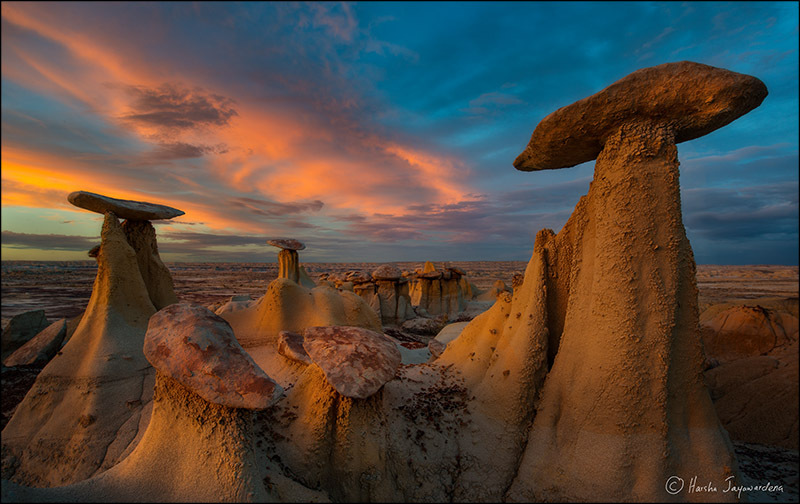 Bitsi is an alien landscape in the St. Juan basin dotted with hoodoos and other strange-looking rock formations. It is near the four corners area. The closest major city is Farmington, NM. It is about a three hours drive from Albuquerque. Very few people visit this remote area. Most of the area is public land managed by BLM. However some of the adjacent land is private native Indian land. According to my research, spring and fall are the best times to visit. Spring can be windy and the fall is the end of the rainy season. 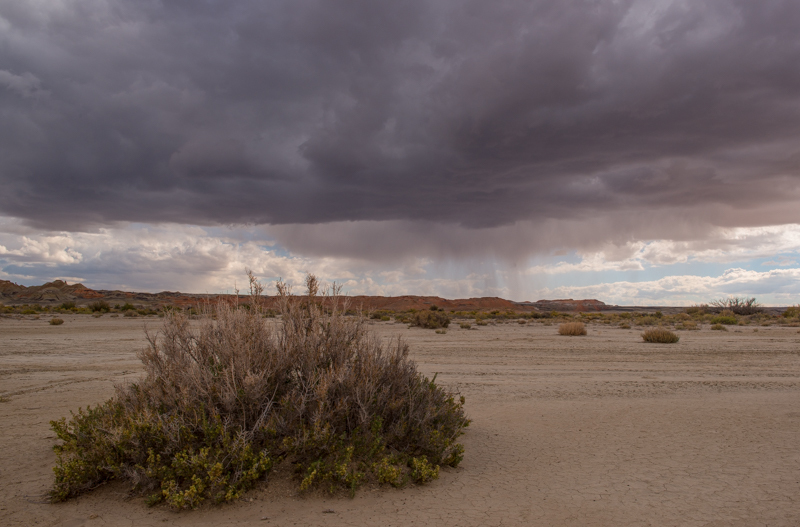 Summer can be very hot, but this is the best time to visit if you want dramatic skies. Winter can be very cold. I flew to Albuquerque and rented a SUV packed with camping gear and enough food to last for several days. 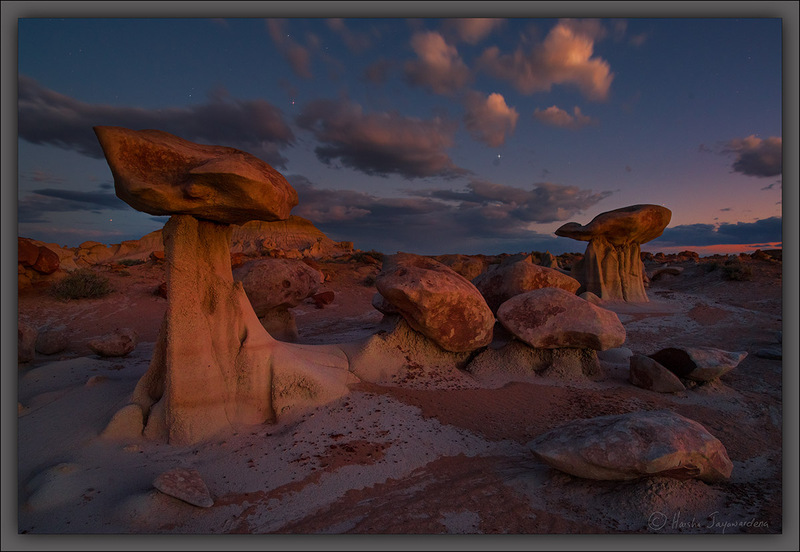 I took I-40 west and I-371 north to reach Bisti. It took me nearly 3 hrs to get there. 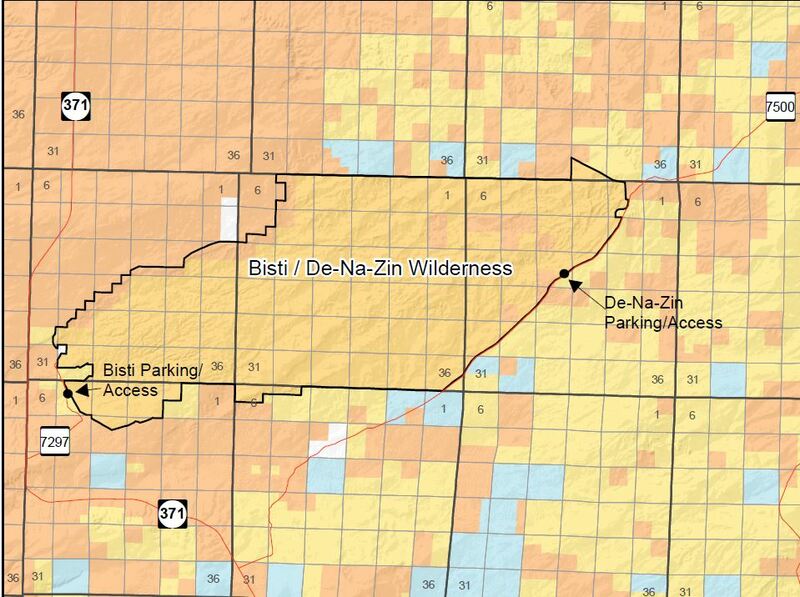 The Bitsi wilderness consists of two main washers. The Hunter wash is to the north and the Alamo wash is to the south. Even though these two washes are right next to each other, there is no direct road between the two. Road 7280 between the two is impassable due to flooding. You have to go back to 371 to reach the other wash. From the parking lot the badlands expands to the east and ascends. If you ever get lost go west until you reach the road and then find the parking lot. There are no trails, signs or facilities at Bitsi. Primitive camping is allowed. Thunderstorms can be very dramatic in New Mexico. 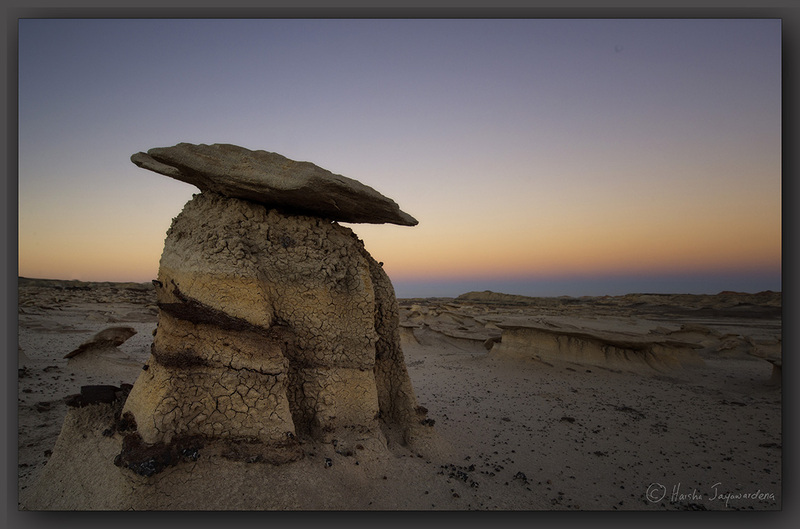 You don’t want to be caught in a thunderstorm in the Bisti area. You will get stuck regardless of what kind of vehicle you drive. After a rainfall the sand turns into sticky and slick paste making the roads impassable. If you’re travelling from Farmington take I-371 south and make a left to county road 7290. At the junction there is a historical marker. 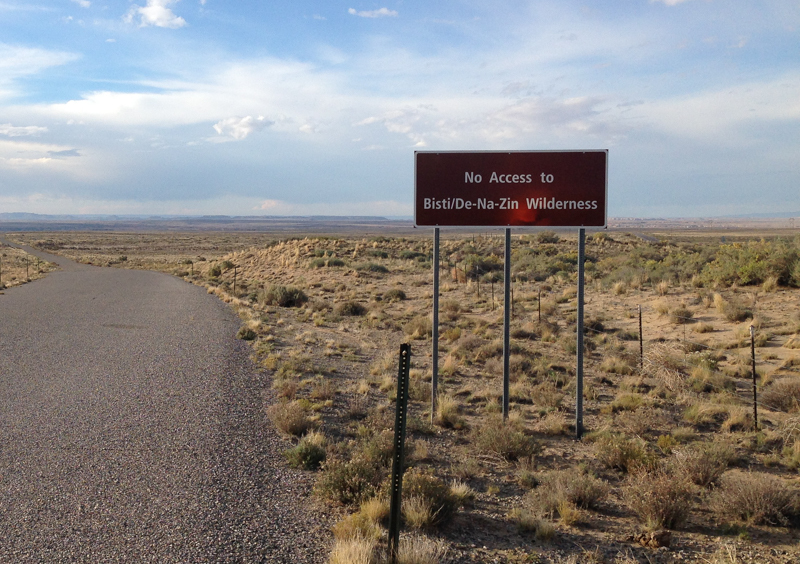 At the entrance there is a sign stating that you cannot access Bisti/ De-Na-Zin. ( This is public land and you’re not trespassing). The road ends at the wilderness parking area. Park near the fence and climb over or under the fence to get to the wilderness area. The road is not well maintained and part of it is washed off. I still think you can make it to parking lot in a passenger car, but a high clearance vehicle is recommended. From here go east for close to a mile to find interesting hoodoo formations. The main attraction here are the wings. I photographed these from a mound at a lower level looking up. From here you can frame both wings. Climbing up to them gives you a different perspective (the image above). There are many interesting hoodoo formations nearby. This wash has two parking areas (an old parking area, as well as a new one). The old parking area is bigger, but the newer one has a sign. From here head east. 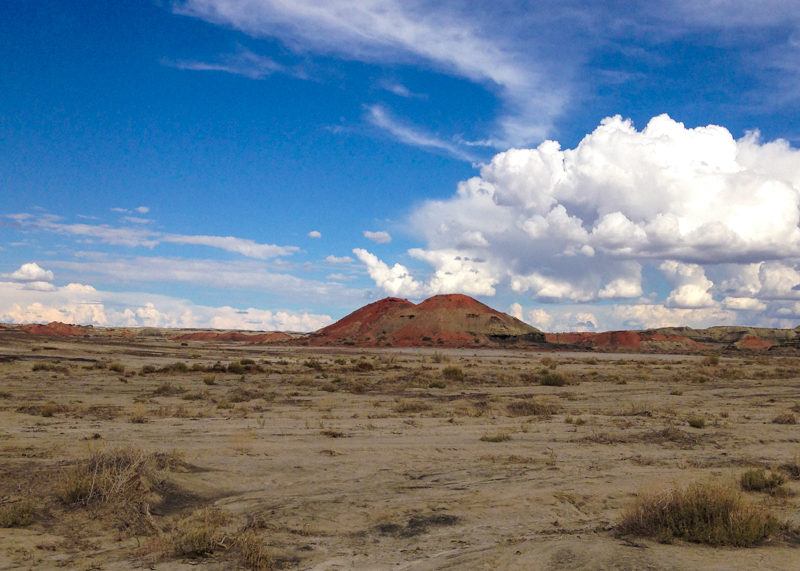 Your first landmark is two red mounds at a distance. Head towards those red mounds. This trail is parallel to a fence line that extends for quite a distance. The fence line takes a left turn after you pass the red mounds. If you want to see cracked eggs and other formations keep to the right (southeast) of the mounds and follow the wash. Your next landmark is two black hills at a distance. Now you want to be on the left hand side of the hills. Again head south and follow the wash. The cracked egg factory is around the corner. This can be easily missed if you don’t pay attention. After photographing the egg factory, go east. Each turn takes you to many different hoodoo formations. Keep going until you find the area called Hoodoo City. 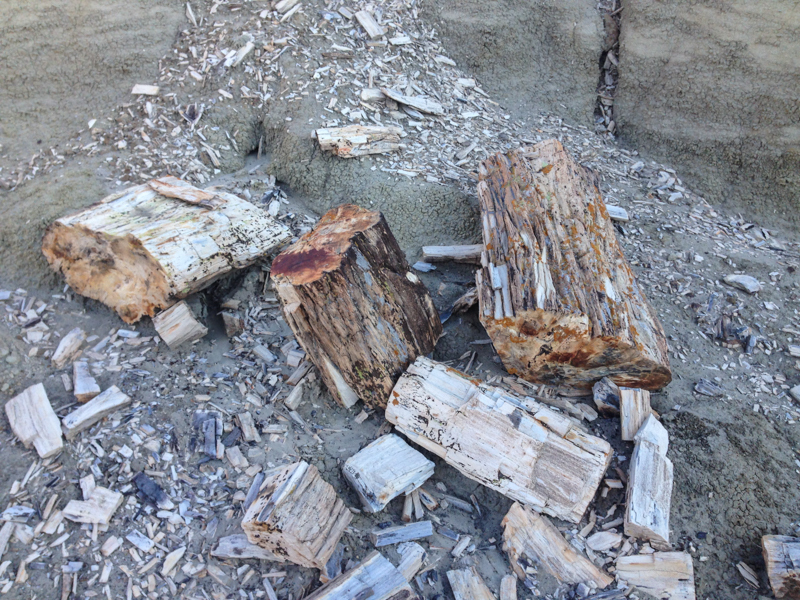 Million year old petrified trees can be found everywhere. Coming back you may want to check out the hunter wash from this side. If you decide to do that follow the fence line when it starts taking the left hand turn (north). The hike here is definitely more interesting. On my way back from hunter wash I tried to use memory instead of my GPS (thought I wouldn’t recommend this). I lost my way and wasted 45 minutes trying to get back to the parking lot. 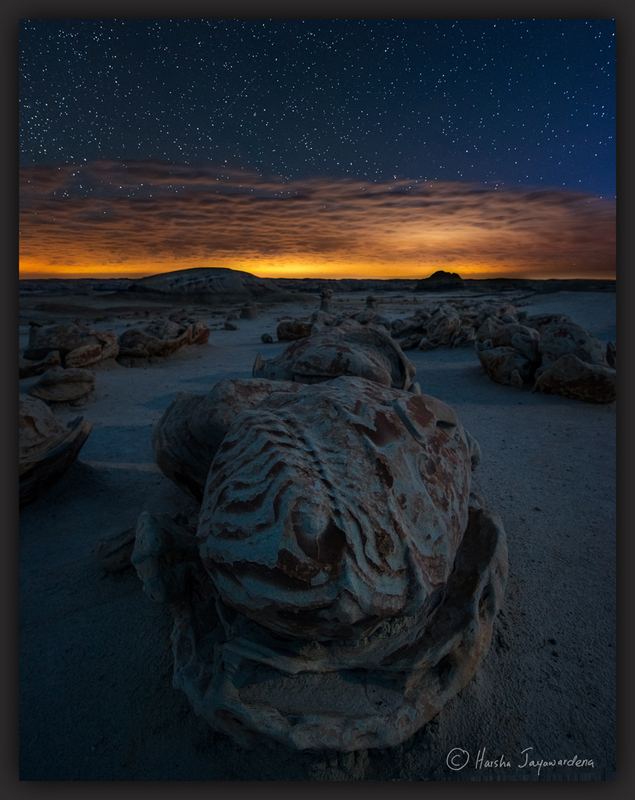 The shot below was taken about an hour before the sunrise. You can see the first light on the right upper corner. 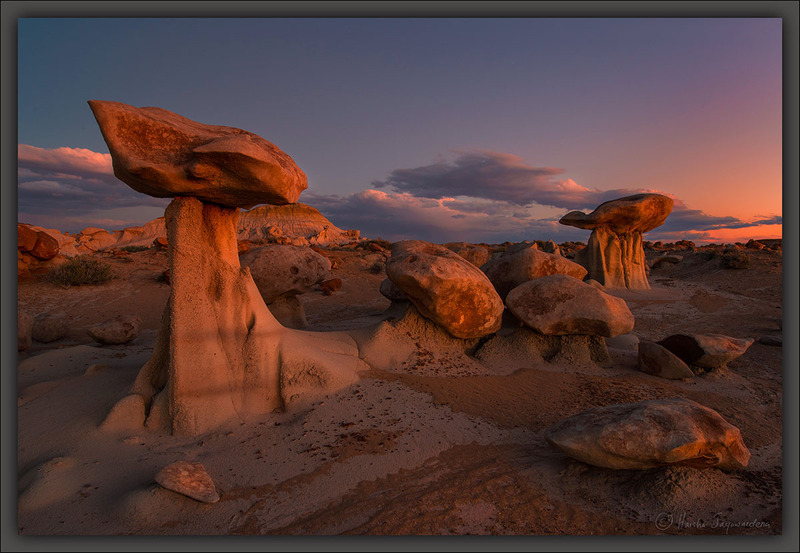 Don’t forget to visit the Ah-Shi-Sle-Pah Wilderness Area when visiting Bisti. 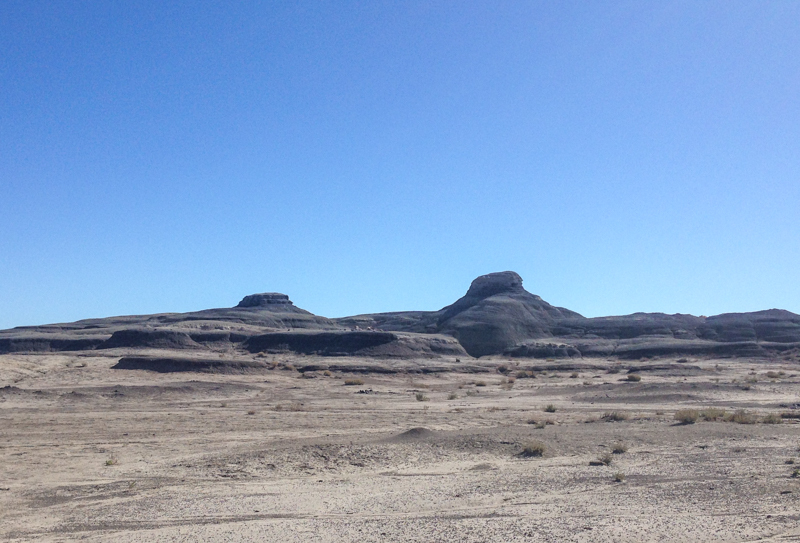 This part of the badlands is between Chaco Canyon and Bistsi Wilderness. This area was made famous by the discovery of a specimen of a dinosaur from the late Cretaceous Period. The specimen was unearthed by Charles Sternberg and is now preserved at the Museum of Evolution in Uppsala Sweden. 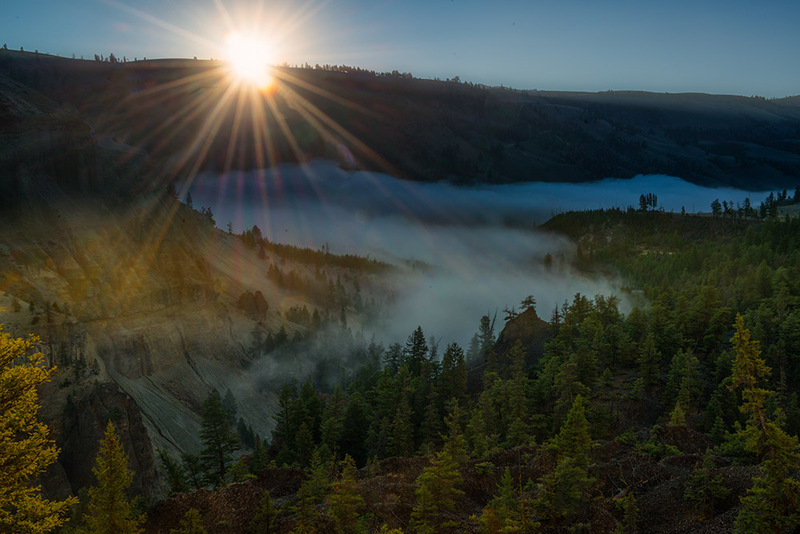 Ah-Shi-Sle-Pah is known for its yellow capped hoodoos. It is conveniently divided into three main areas. 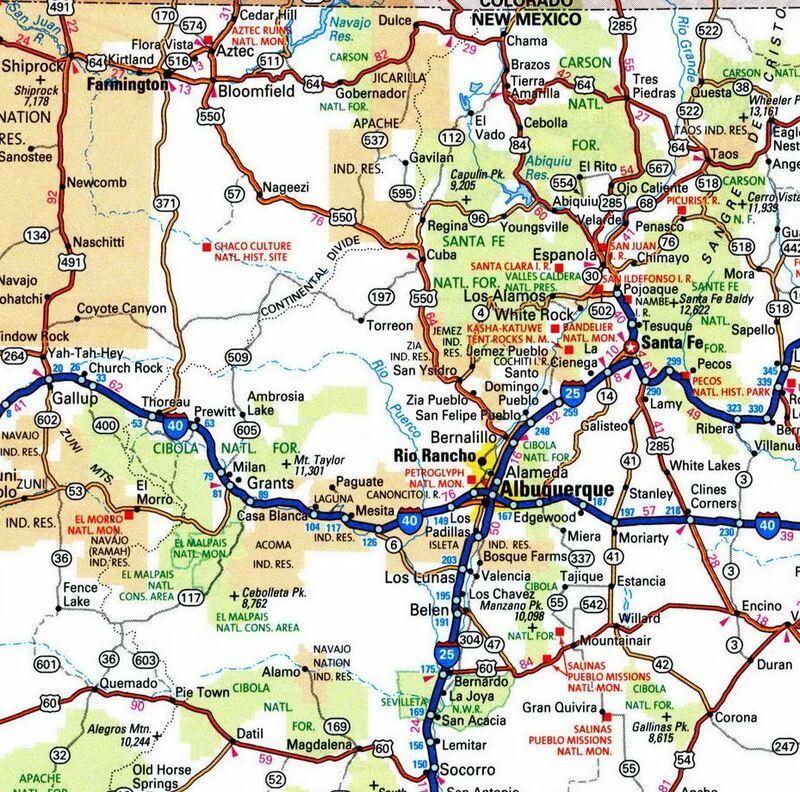 If you’re coming from Farmington, take 371 south to mile post 61. Take a left turn to 7650. Go 7.6 miles and make a right turn to 7870. Go 7.6 miles until you come to a T-junction. Make a left and drive 2.6 miles to the parking area for Ah-Shi-Sle-Pah on the left hand side. There is only room for one car at this parking spot, but you can park on the road. From here to the trail head is 0.6 miles. On my first visit, I arrived there around 2:30pm then set off around 3:30 to scout the area. As soon as I reached the main area, I went to the valley to explore. You can also get good views from the edge of the rim. Nonetheless, I wanted to photograph the yellow hoodoo which is shown here. I could see it from the valley, but there was no easy way to get up there. After trying many routes, I finally managed to reach the area. The first thing I did upon arrival here, was to make note of the best way out in case I decided to stay late. The climb is scary and not for the faint of heart (unless, of course, there is an easy way to get up that I was unable to find). A GPS unit is highly recommended to find your way around. 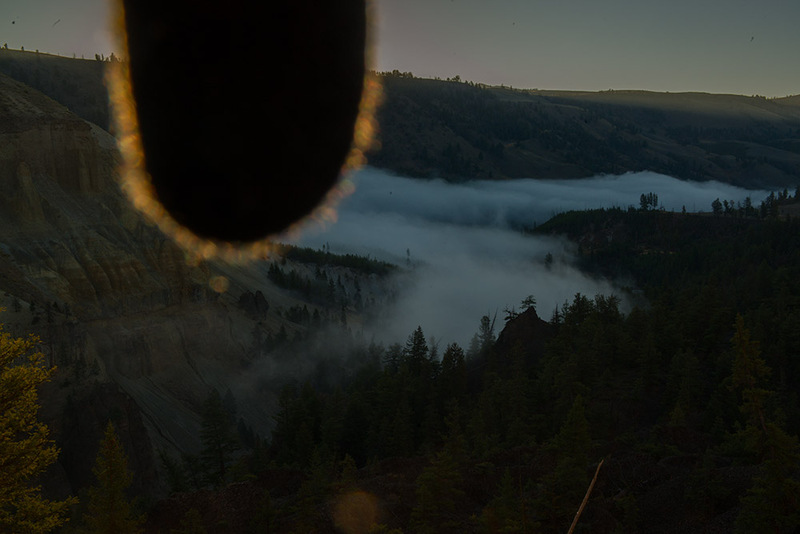 This area is famous for the hoodoo with a long wing perched on a rock mound. To get to KOW take 7650 for 10.5 miles and turn left into a jeep trail that will take you to a windmill which you can see from the main road. You can park here or continue on the same trail for another 1/2 Mile. 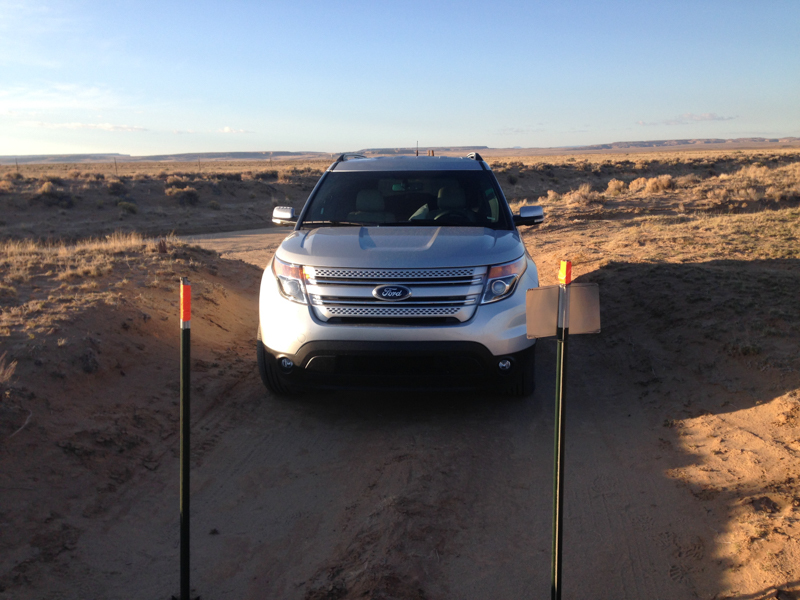 If you continue on the trail, then assure you have a high clearance vehicle since the road becomes rough. There is an open area on the left hand side where you can park. Once you park, head south towards the KOW. I parked beyond the windmill. To my surprise, there was another SUV already at the parking area. This area is tribal land so please do not camp here. You have to first go under the fence line heading south. After a while you come across a sea of green mounds that you have to cross. Some of the mounds are impossible to cross. The best way is to go around it. If you look to your right hand side you can see a small hill covered in wiry scrub. Head toward that and try to go around the mounds in a southerly direction. KOW is hidden from sight until you’re very close to it. I was there at sunset with only a few clouds. I did star trails until 11pm. 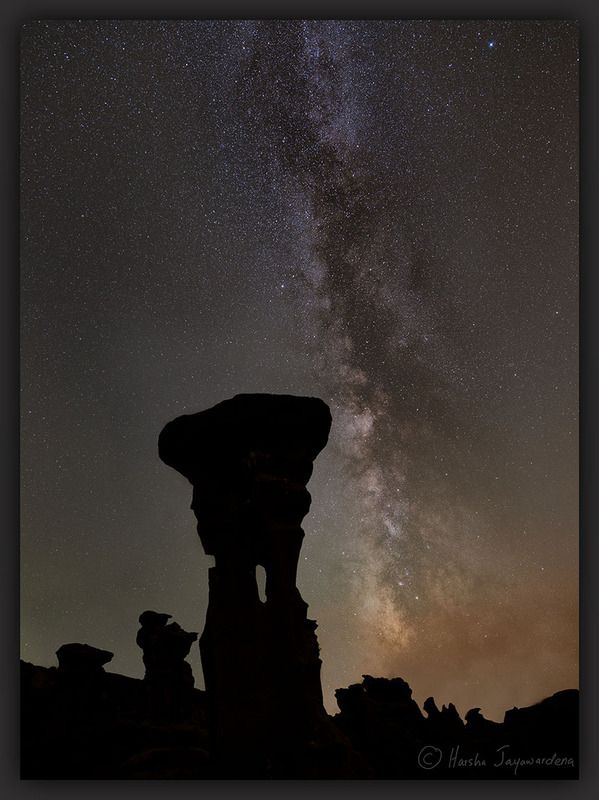 While my camera was running, I lay on a flat rock and looked at the stars and the beautiful milky way. I was annoyed by all the air traffic at night because it ruined many of my frames, thus creating more work for me. One should prepare for the cooler temperatures here at night. I started heading to my car close to midnight. It took me about 48 minutes to follow the route back using my GPS device. Make sure you have two headlights if you decide to get back at night in case one fails. It happened to me and the thought of spending the night there was kind of scary. Take CR 7650 for 7.8 miles and then turn into 7870 and drive for about 7.5 miles. Turn left to an unmarked road and head north for about 0.4 miles. bear left and go another 0.7 miles then make a sharp left. Drive for 0.4 miles and park. Once you have parked here, mark it on your GPS and head north. It is about a mile hike but you have to cross a few dry creeks to get there. 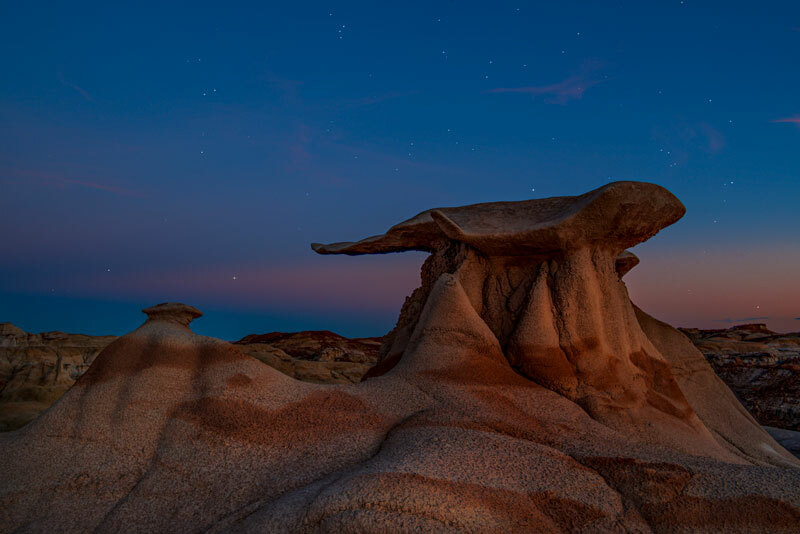 As you travel, there are many interesting hoodoo formations including an ancient roman city, mushroom formations and hoodoos looking like temples. Mark these sights on your GPS while scouting so you can come back to these when light is better. 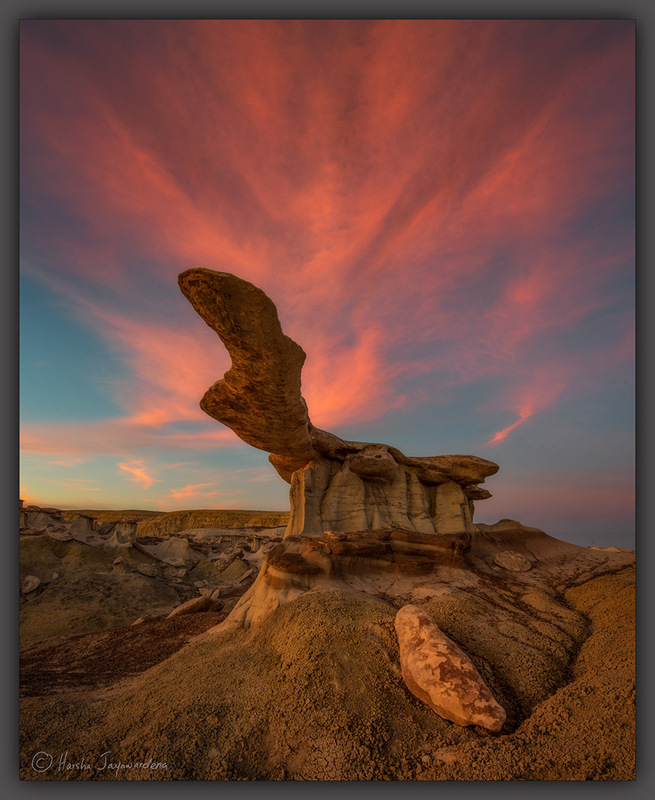 There is another group of hoodoos called Valley of dreams east. I found these less interesting, but you might think otherwise. 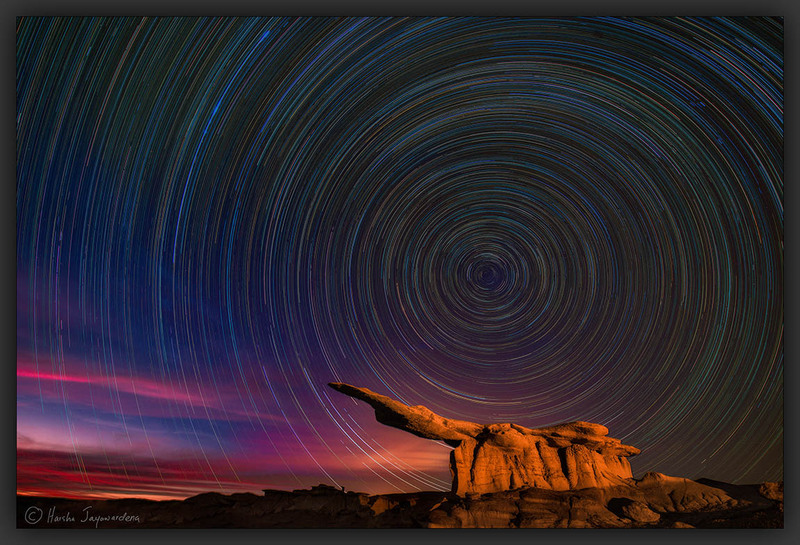 You can drive right up to these hoodoos so they are ideal for star trails. While the camera is running you can sleep in the safety of your car. 1. Take a GPS and extra batteries. Map will be useful if you don’t have a GPS. 2. 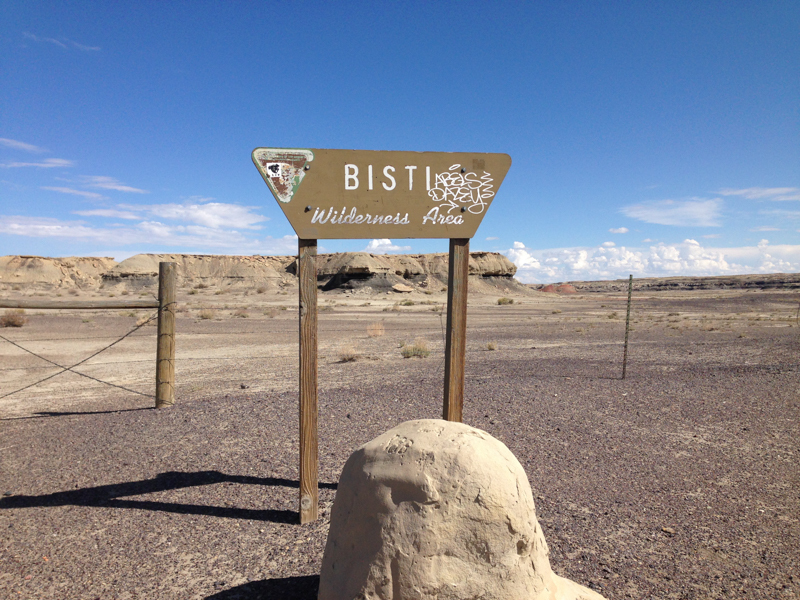 In Bisti, walk west if you got lost. This will take you to the road. 3. Do not go there in rain. You will get stuck. 4. Scout the area in advance. 6. Take plenty of water and a headlight in case you decide to walk to the car in the dark. If you find any of this info is inaccurate then please let me know so that I can make corrections. Finally I have a new FB page https://www.facebook.com/pages/Harsha-Jayawardena-Photography/356029497940998 Please like the page if you want to follow my Photography. 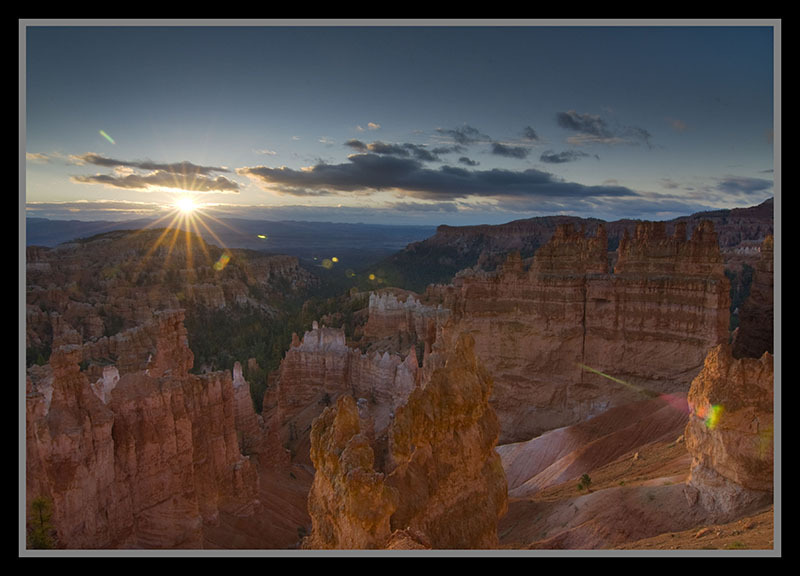 I love to include a sunburst or sun star in my images. 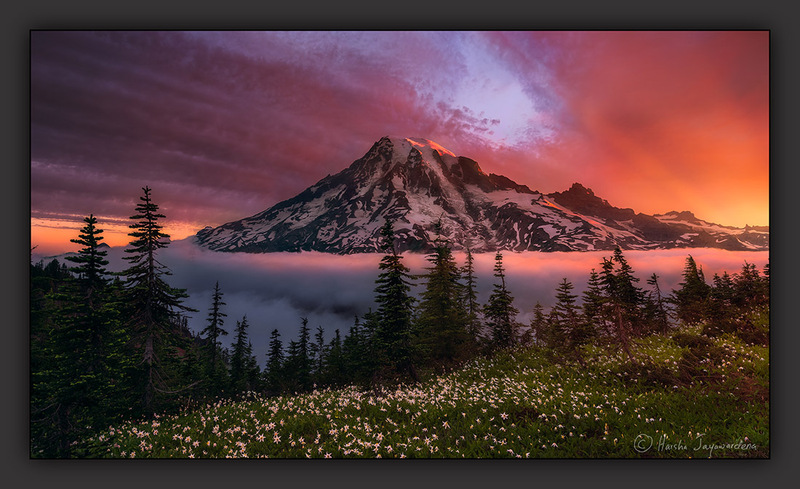 Sun star gives that special wow to an image and draws the eye to that area. It works best when the sun is low in the horizon such as in the late afternoon, sunset and sunrise. 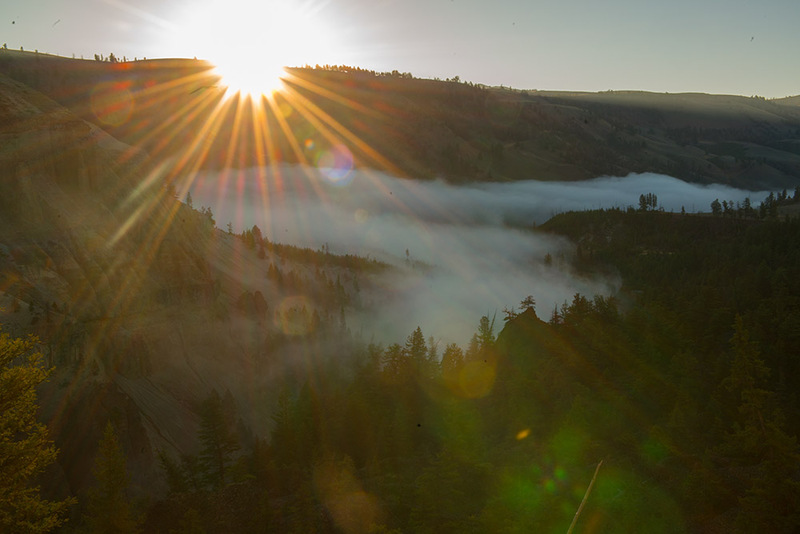 Covering the sun partially with a cloud, mountain or a tree branch can reduce the flare. You need a very small aperture of at least F14 to capture the radiating beams of the sun. The light rays are created by light diffraction (bending of light) at the aperture blades at these smaller F stops. 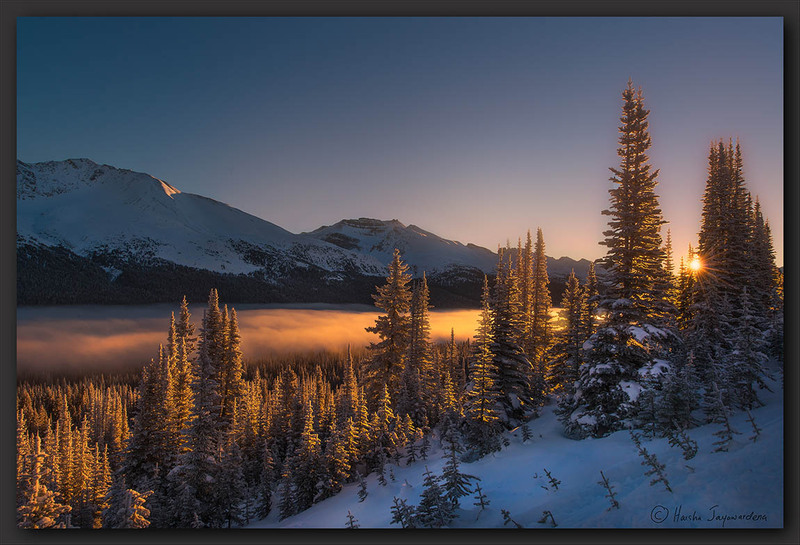 Include the sun in the upper third of the image for better composition. 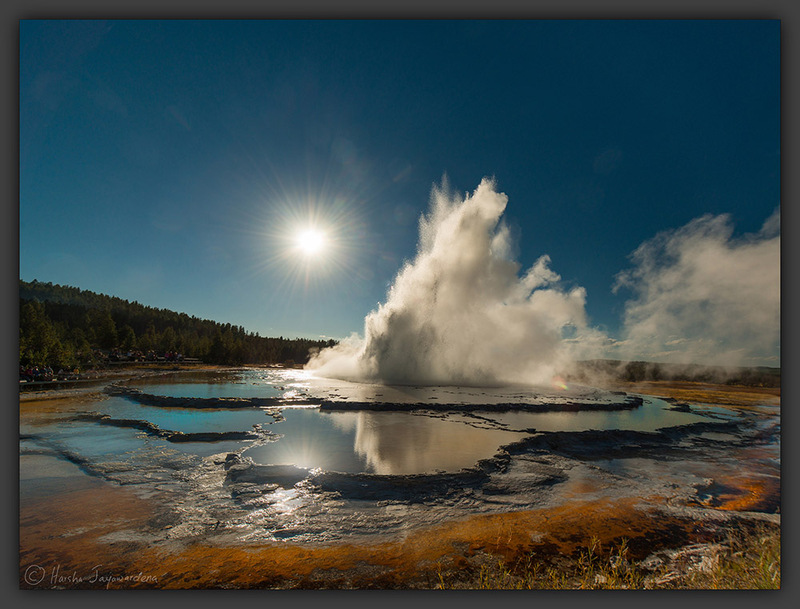 Sometime sunstars can occur even at F8 under certain conditions.The image below was taken at Great fountain Geyser , Yellowstone in a late afternoon. The camera F stop was 8. 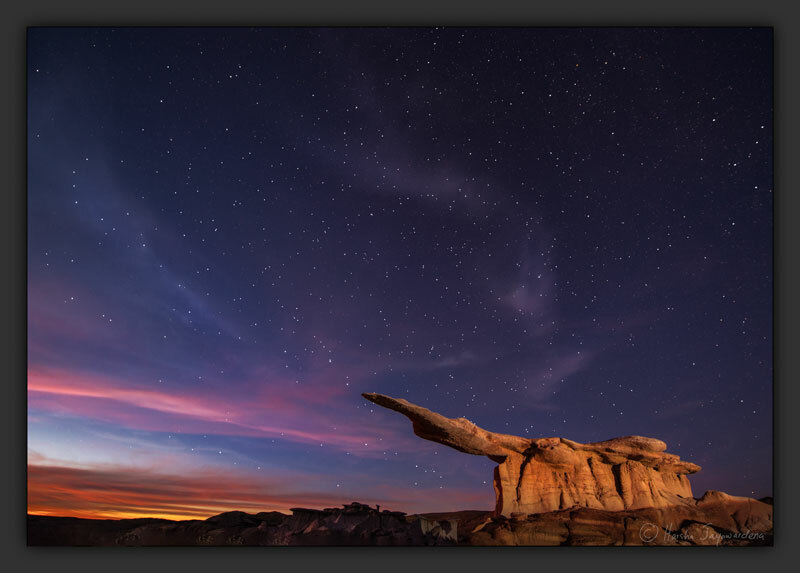 I used a 14mm lens and a polarizer and was surprised to see a nice sunstar. That was created by the low angle of the sun and the sun light filtering through all of the mist from the erupting geyser. The shape of the sunstar is influenced by the number of blades in the lens and the shape of the aperture of a given lens. Some lenses are known to create better sunbursts. Unwanted effect of shooting directly into the sun is the lens flare. The flare is caused by light reflections inside the lens itself. Many factors contribute to this. 1. Certain type of lenses are more prone to this. High quality lenses have many anti reflective coatings applied to the surface that reduce the flare. Nikon uses a Nano coating and fluoride coating to reduce the flare and Canon lenses have similar coatings. 2. Presence of a protective filter such as a UV filter can make the flare worse. Remove the filter to reduce that. 3. The best way to avoid the flare is to use the lens hood provided with the lens. This significantly reduces the flare by preventing stray light from entering the lens. 4. Dirt on the lens makes the flare worse and a clean lens goes a long way to avoid this. In spite of all the precautions mentioned above, you can still get lens flare. Of course if you hide the sun behind a tree or mountain in your composition you’re not going to see the flare but then that beautiful sun star is not going to be in the image. There are few things you can do to help the situation. Use a piece of cardboard or your hat as an extension of your lens hood. Experiment with the angle to shade the lens while looking through the view finder. When you don’t see the flare press the shutter. Changing the angle of the camera may also help. Another trick that works is to take a shot with the flare and take another shot placing your finger in front of the sun to cover it. 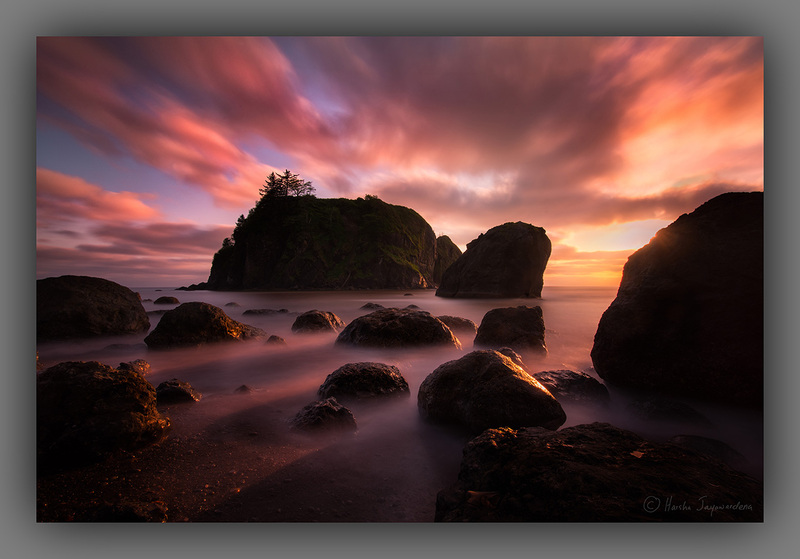 As longs as the composition hasn’t changed the two shots can be combined later. This works best for me. Here is how this is done. The image is not a great shot and was shown here for demonstration only. Here is my first exposure shooting directly into the sun. Noticed the flare. The next shot was taken with a finger to cover the sun. This significantly reduced the flare but you still can see it. I combined the two in PS and did some minor correction to get the final image shown below. It still shows my sloppy work with healing brush tool but you get the idea. 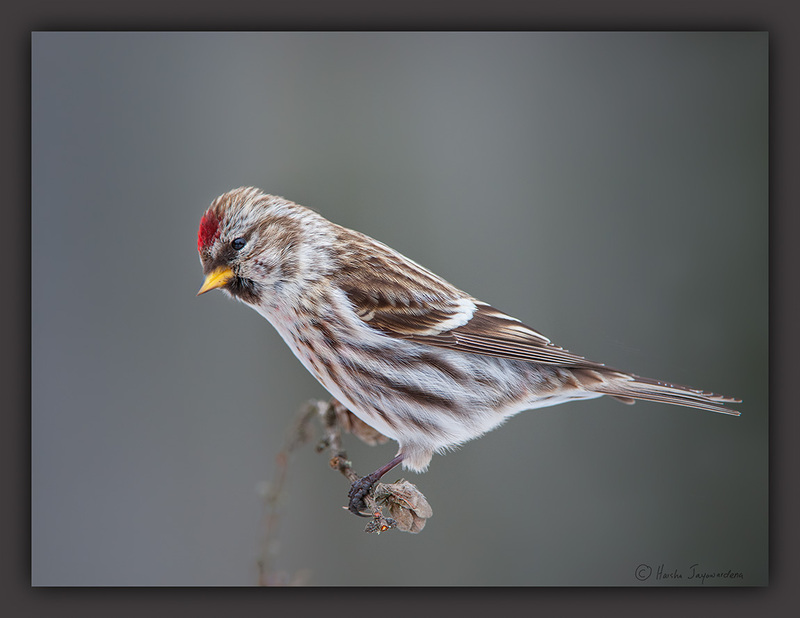 I had the weekend off and decided to go Sax Zim Bog looking for owls. 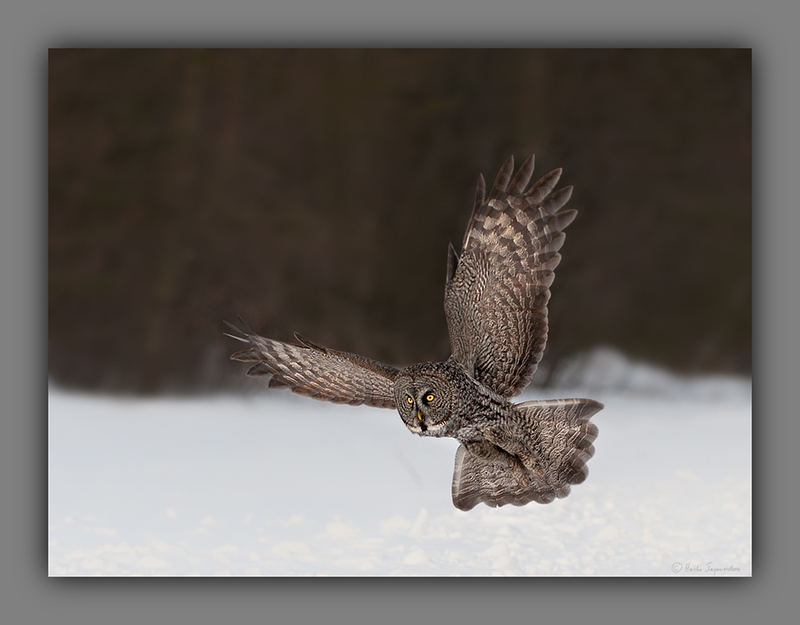 I saw only one Great Grey Owl in poor lighting and no hawk owls.. 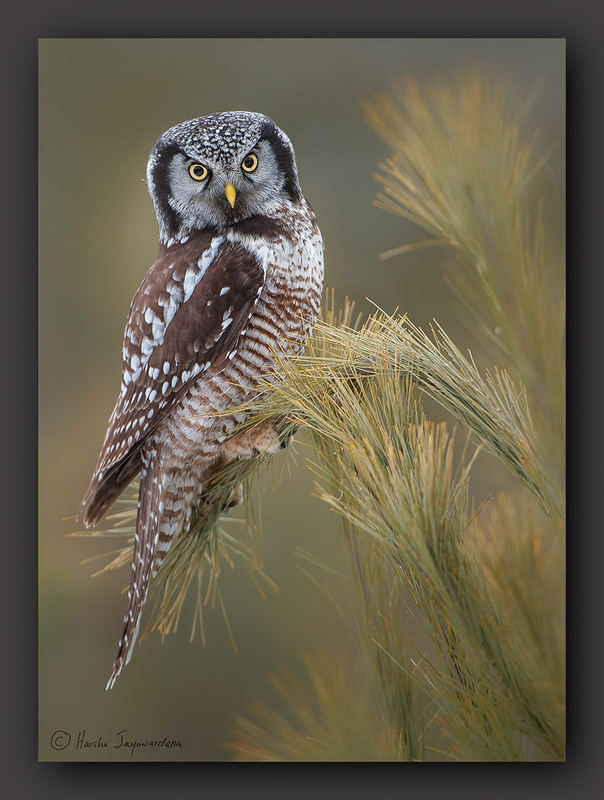 However I got to see a Northern Hawk Owl near Duluth.. He was corporative for few minutes before flying off. Finches at the feeders were very active. 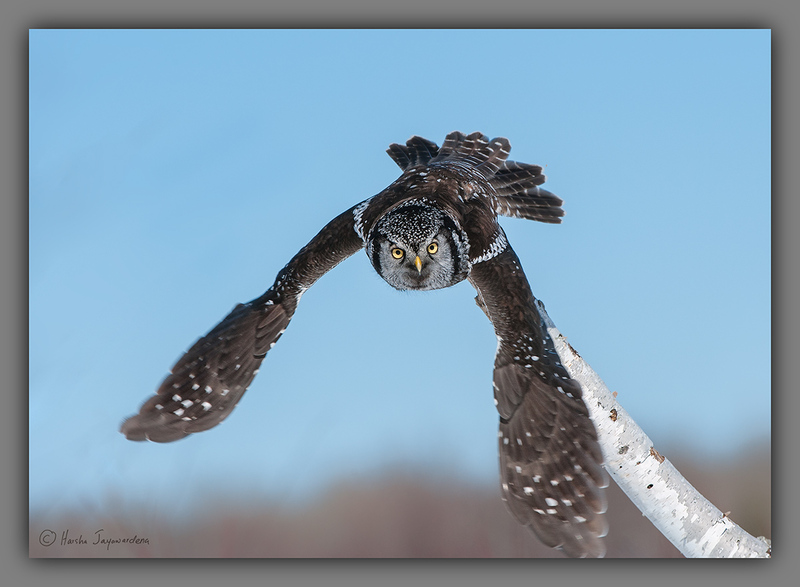 These are the only Great Grey Owl shots I got. .
Stay tuned for trip reports on Canadian Rockies and Bisti Badlands of New Mexico. 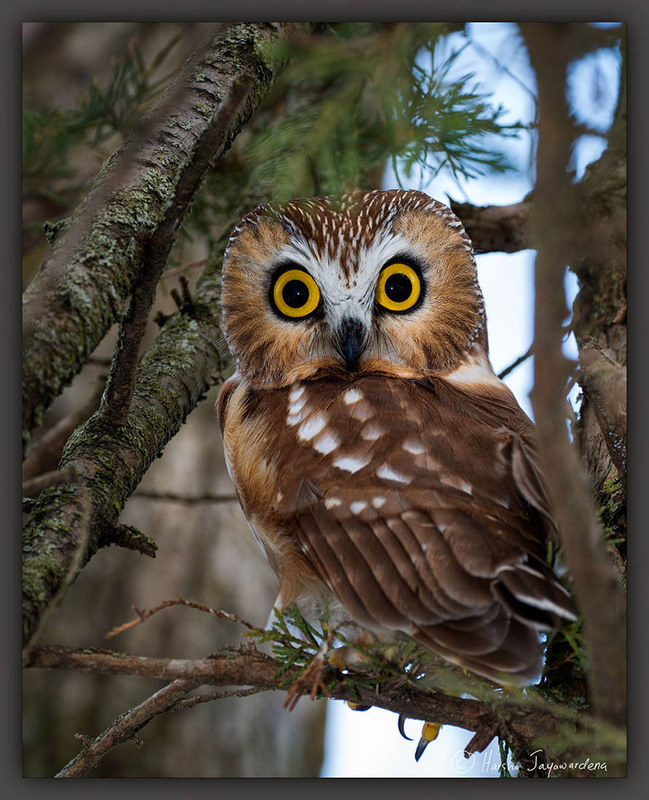 Saw Whet Owl is one of the cutest owls you can find in North America. These owls are particularly friendly and tolerate the proximity of humans. This owl is about the size of an American Robin.They typically spend their daylight hours sleeping on a branch just above the eye level. At night fall they begin their hunt for small mammals like mice. 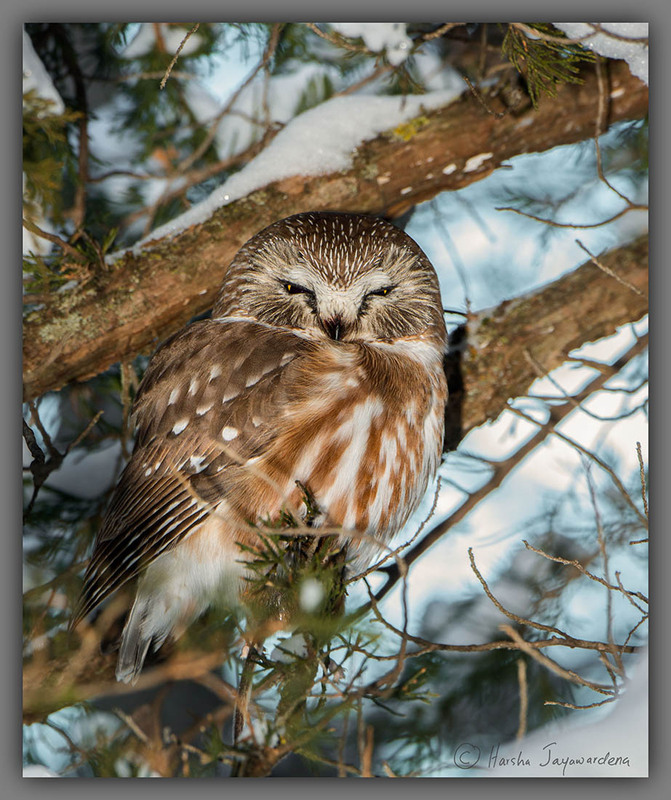 I have been fortunate to find a saw whet owl close to where I live every winter. This winter was no exception. My first two outings around Christmas yielded nothing. Not only did I not find the owl but I also lost my tripod head which came undone from the tripod while I was navigating among the thick brush. Little did I know that this was a blessing in disguise. Three days later when I realized that I lost the tripod head I decided to go looking for it. Fortunately, I could still see my footsteps in the snow. After 45 minutes of searching I found the tripod head. 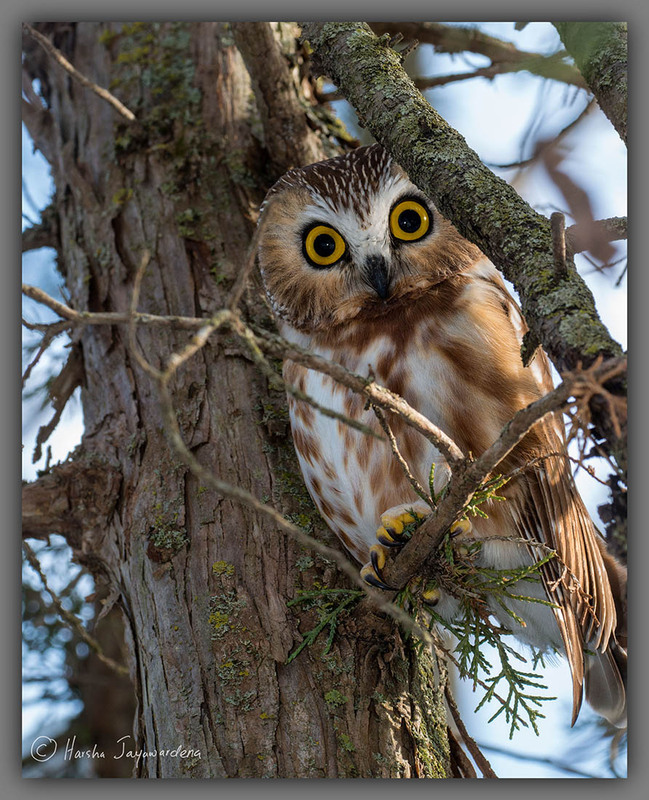 Just a few feet away the saw whet owl was waiting for me. To my surprise it was very alert. The big yellow eyes followed my every move. Two days later we had 5-6 inches of snow. The temperature was a frigid 1*F with gusting winds. Against my better judgement, I decided to head over to the nature center looking for the owl. 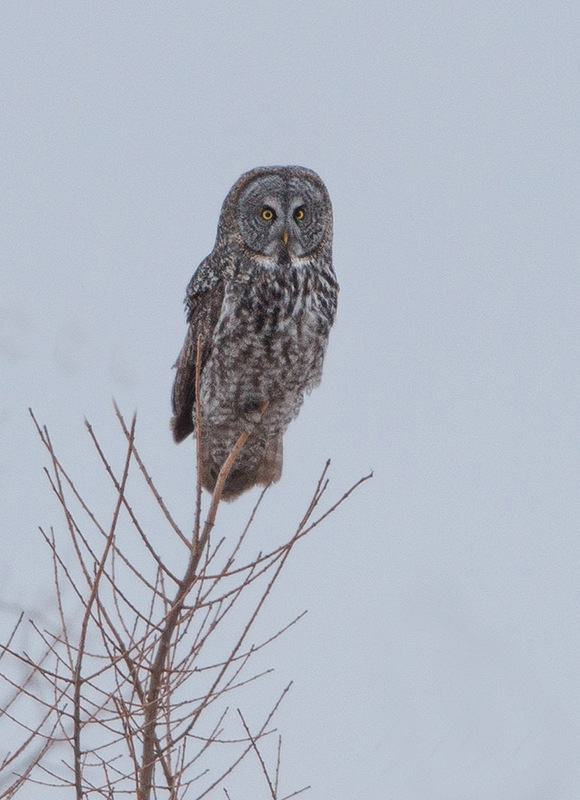 I found the owl about two hundred feet to the north of my original sighting. The owl was clearly not as impressed with me. It hardly open its eyes. 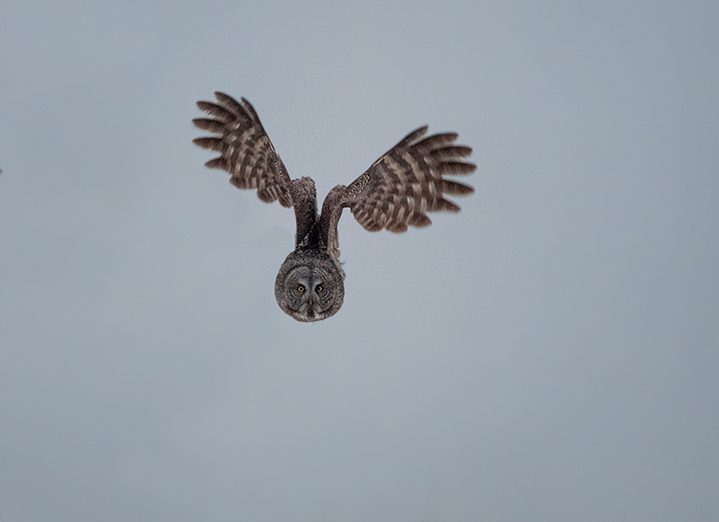 After observing the owl for about 30 minutes I was ready to head home but decided to get a picture from a different angle. Then I noticed the mouse. The owl had caught a mouse and gone to sleep holding on to it. I am sure he/she was saving the poor mouse for a snack later on.